This table will seat 10 - 12 people. 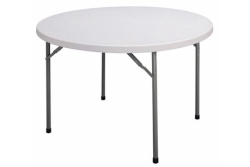 This table is most commonly used for seating for large events. 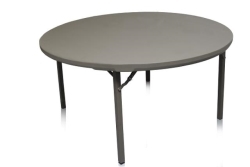 Due to the large diameter of this table, it does not provided as intimate of a setting as a 5' round. 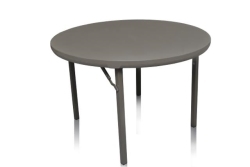 108" round - This size of linen will hang half way down the table. 132" round -This size of linen will hang to the floor. 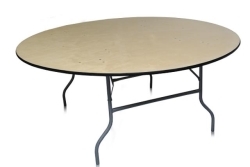 These tables will seat 6 - 8 people and is the most commonly used round table. They are most commonly used for seating. 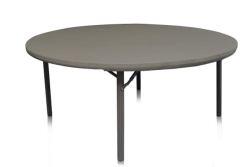 90" round - This size of linen will hang half way down the table. 120" round -This size of linen will hang to the floor. 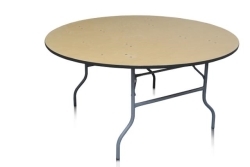 These tables will seat 4 -6 people. They are used in a variety of different ways, but is most commonly used for display or seating. 108" round -This size of linen will hang to the floor. 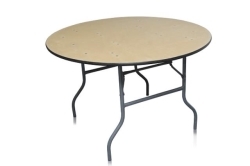 We recommend covering plywood tables with linens as these tables are unfinished wood.